Sorry for the gap in posts, I’ll try to solve that in the next few days. If you’ve been following the Twitter feed (@wildcardweather) today it was mostly Isaac-related retweets. It’s late August and the tropics are really getting active. Statistically, late August into September is the most active time for tropical storms. At about 5pm EDT Tropical Depression 9 became Tropical Storm Isaac. THE NORTH OF THE MAIN CONVECTIVE MASS. This is a system meteorologists have been paying close attention to for some days. As the large area of low pressure moved west across the Atlantic, the GFS model consistently forecast it to grow into a hurricane and turn towards the US mainland. That far out, the forecast track was constantly changing; sometimes it would lead into the Gulf of Mexico and sometimes make landfall on Florida’s Atlantic coast. As the system has developed, the level of uncertainty has dropped and we have a better idea where this storm is heading. The current GFS model run, forecasting Isaac to cross Hispanola and then head to Cuba and Florida. These models are run with many members, each with slightly different initial conditions. All the members are then averaged, producing a model that drastically reduces error. Image owned by Weather Underground. The GFS (for Global Forecast System) model is one of the most trusted in the business and is usually a meteorologist’s starting point when forecasting. Along with the NAM (North American Mesoscale) and a few others, it’s one of the models NWS allows you to run for free on their website. To take a look and run your own GFS model go to NWS NCEP’s Model Guidance page. Meteorologists were paying attention to the GFS the past few days because it can forecast up to 16 days out. At the time it was one of the only models capable of tracking the tropical depression all the way to Florida or the Gulf. Today we can forecast Isaac using a whole suite of models and right now many of them are in agreement. The majority of them bring Isaac south of Puerto Rico and towards Haiti and the Dominican Republic. After that, Cuba and Florida landfalls seem probable. Isaac’s forecast tracks. Each line represents the prediction of a different model. 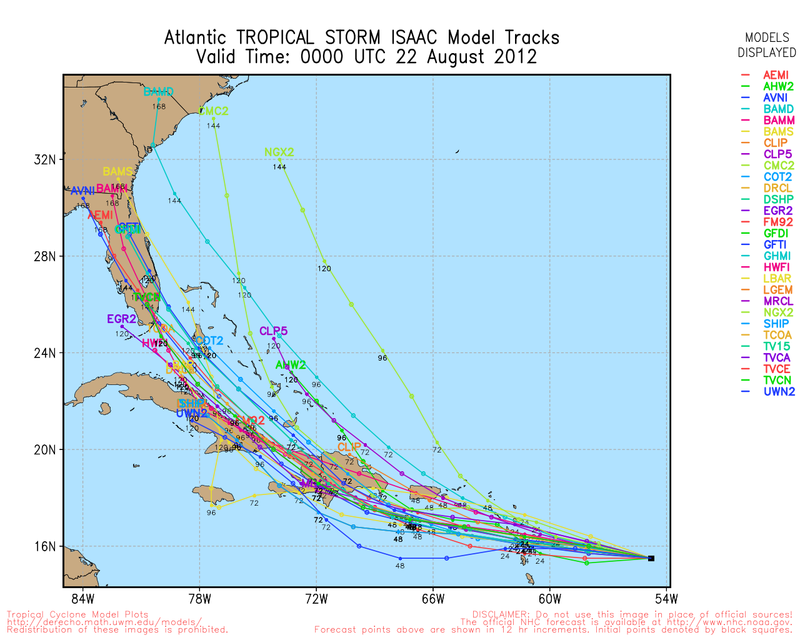 With a few outliers, model’s seem to be bringing Isaac to Florida late this weekend. As we discussed in an earlier post, hurricanes lose their intensity when they’re no longer over water. As such, Isaac’s intensity heading into this weekend depends heavily on its exact path. The high elevations of the island nations in the Caribbean can drastically weaken storms, so the less land Isaac crosses the stronger it will be. At the moment, the National Hurricane Center’s 5-day Cone has the storm at hurricane strength as it approaches Florida this Sunday. All of Florida should be closely monitoring this storm in the days to come. I’d like to once again make a shout-out to Mike’s Weather Page, my favorite page for following hurricanes.